Staples released their Black Friday deals circular, and it pops with electronics deals sure to bring in crowds of eager buyers. 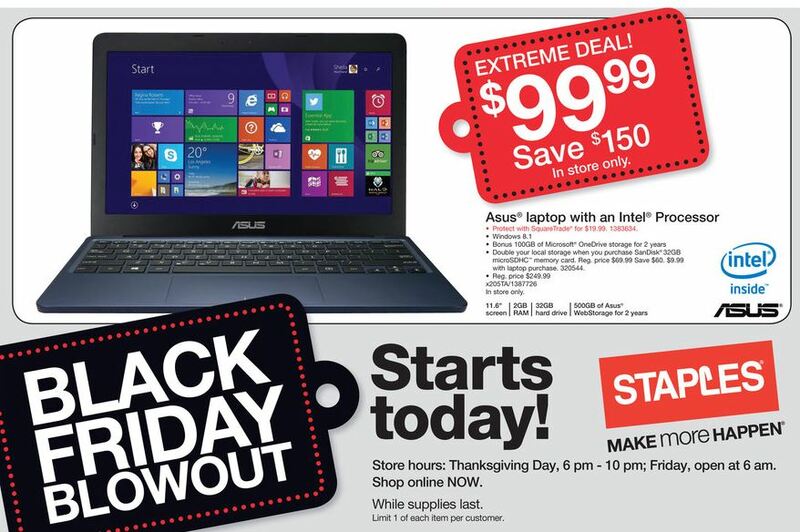 The ad features an ASUS laptop computer for $99.99 (limit one per customer). The laptop sports a 11.6″ display and 2 GB of RAM and runs Windows 8.1. It comes with a small (32 GB) flash hard drive, but includes 500 GB of ASUS cloud storage free for two years and 100 GB of Microsoft OneDrive cloud storage for two years. You can also add a 32 GB microSD card for additional storage space. 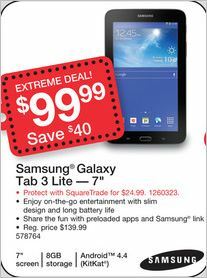 You can snag a 7″ Samsung Galaxy Tab 3 Lite for $99.99 (limit one per customer). The Android 4.4 KitKat device features 8 GB of onboard memory and weighs 11.2 ounces. It includes a 2 MP rear-facing camera and will accept up to a 32 GB microSD card for added storage space. Staples will also offer a great deal on a larger Samsung tablet, selling the Samsung Galaxy Tab 4 10″ white tablet with 16 GB of onboard storage for only $249.99. The Android 4.4 KitKat device measures 6.94″ by 9.58″ by .31″ and weighs just over a pound. It’ll accept up to a 64 GB microSD card for additional storage space. You can pick up an Amazon Kindle e-reader for $49. This is just an e-reader, not a full-fledged Android tablet like the Amazon Kindle Fire line, and it’s a version that shows ads. 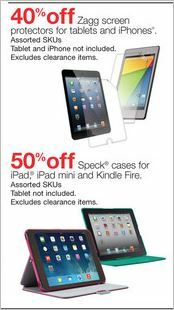 Staples Black Friday deals include Kindle Fire tablets as well. The Kindle Fire HD Android Wi-Fi tablet with special offers will go for $79. The tablet offers a 6″ HD touchscreen, 8 GB of internal storage and front and rear cameras. For $109, you can take home a Kindle Fire HD 7″ Wi-Fi tablet with special offers, featuring 8 GB of onboard storage and front and rear facing cameras. Staple s will sell the Amazon Fire TV streaming media player for $74 – about $25 lower than the device’s usual price. Fire TV requires an HD TV and HDMI cable, sold separately. The Roku Streaming Stick will sell for just $39.99. It also requires an HD TV, but plugs in directly to the television set without requiring an additional cable. A Logitech M320 wireless mouse, available in a selection of different colors, will sell for $9.99 on Black Friday, and you can take home a 1 TB Toshibo USB hard drive for $49.99. Apple fans can snag an Apple TV device for $79 or an iTunes gift card for 15 percent off when you spend $50 or more. In addition, Staples will discount certain Apple iPhone and iPad accessories, such as screen protectors and cases, by 40 to 50 percent. Staples will sell Keurig coffee brewers discounted to between $99.99 and $159.99 and include Staples gift cards of between $10 and $30 with a Keurig brewer purchase. 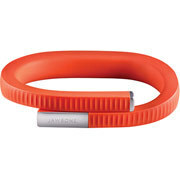 Jawbone Up and Up 24 fitness trackers will sell for $79.99 to $99.99 with $25 Visa gift card available by submitting an Easy Rebate request. Staples stores will be open 6 p.m. to 10 p.m. on Thanksgiving Day and starting at 6 a.m. on Black Friday. Best monthly gift box: Which one is right for your loved one?